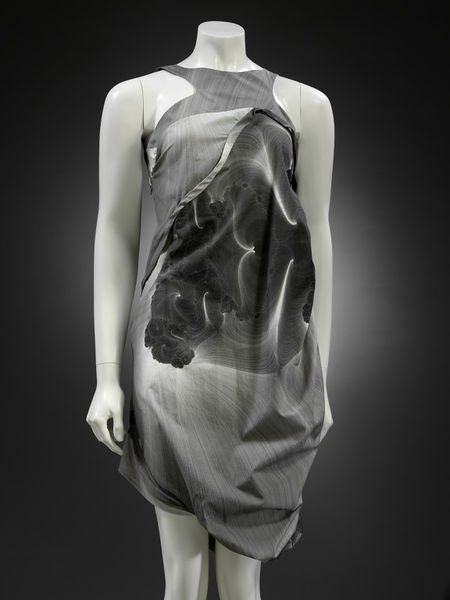 This cleverly cut and draped dress was designed by the New York design collective ThreeASFOUR and was displayed at the V&A in 2007 in the Contemporary New York Fashion exhibition (17 April - 2 September 2007). The ThreeASFOUR label exemplifies New York's international mix in that it was founded in 1998 by Gabi, a Palestinian; Adi from Israel, and Ange from Tajikistan, alongside Kai from Germany (who left the label in 2005, triggering the name change from 'As Four.' The label made its runway debut in 2001, and from the earliest days,demonstrated a profound concern with unexpected cut and construction, with garments that often swirled and blossomed around the body. This asymmetrically cut dress is a design from the Three As Four Spring/Summer 2007 collection which featured textile prints derived from fractals, or chaotic patterns in nature such as crystal growth and galaxy formation. 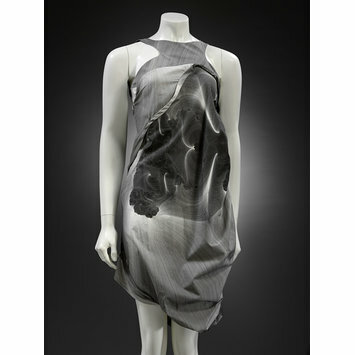 Asymmetrically cut and draped short dress in grey-on-grey printed cotton. Sleeveless, knee length, puffed fabric at hem, diagonal slashed opening across back. Strip of fabric draped around the dress and attached at various points.